We’ve been training dogs professionally since 2011. Our experience and positive, science-based approach allow us to help you and your dog achieve your goals. Raising a new puppy, introducing a rescue dog into your home, or troubleshooting specific behavioral problems that you’re having with your dog? The idea of our private training program is to mark and reward your dog for making the right decisions, as opposed to correcting him for making the wrong decisions. This dog training approach allows us to maintain a healthier, more encouraging relationship with your dog while teaching him what we expect of him. The results will be a dog who is not only trained, but also loves to be trained! With in-home dog training, BlueDog can help with a number of behavioral issues, as well as simply help with basic manners for your dog. In-home private training begins by contacting us to discuss what’s going on and what your goals are. 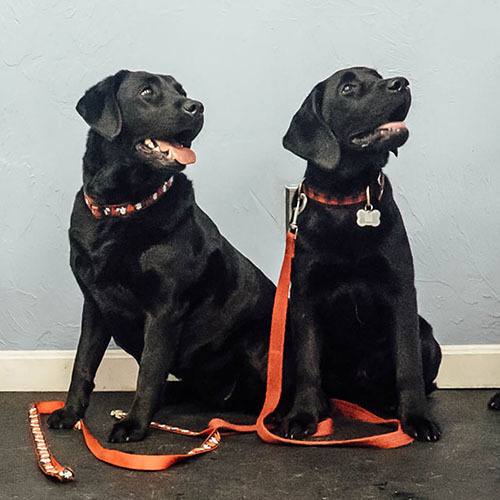 From there, book your first session and your dog trainer will help you come up with a plan that will get your dog on track to becoming the well mannered companion you’ve always wanted. Having some problems with specific behavioral issues? Maybe your dog needs to brush up on some basic obedience or leash work? Preparing for a new puppy? Want to teach your dog how to adjust to a new baby? Our one-hour private training sessions in your home, based on your schedule may be what you need. Call us to find out if private dog training sessions are the right solution for you. We will work directly with you and your family to teach everyone how to train your dog. For areas outside Andover & North Andover please inquire about additional travel charges. Looking to work with your dog around other dogs but still want the individual attention you get from private lessons? BlueDog now offers Semi-Private training sessions! Join another dog owner to work on training your dogs together. We encourage you to invite a friend to join you, or ask BlueDog and we’ll match you up with another dog owner. Price is per dog owner attending the lesson. Not sure where to begin? Don’t worry about it! All private dog training programs begin with a free phone consultation. The goal of the consultation is to help you determine if BlueDog is the best match for you and your dog. Actual dog training will begin on your first session if you decide to move forward. What do people have to say about BlueDog?